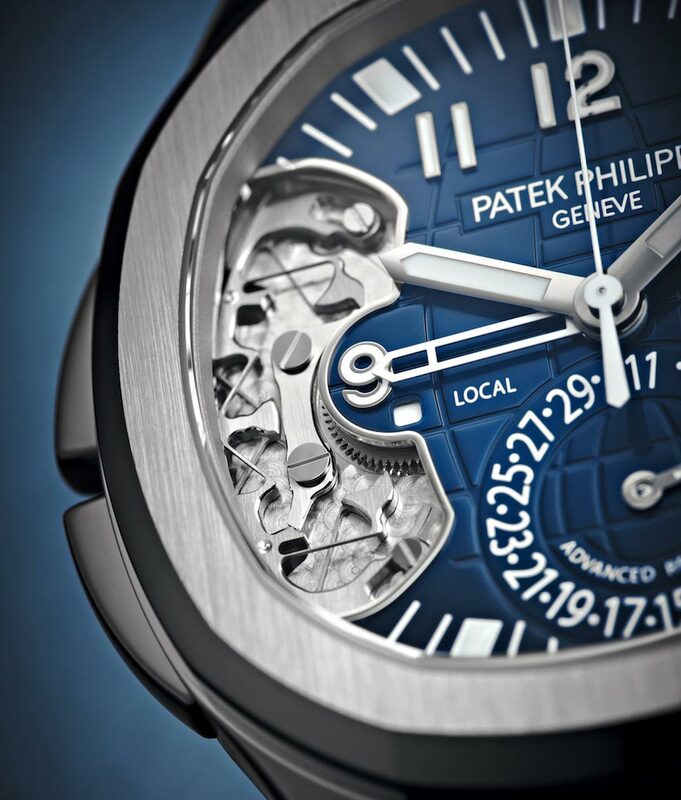 Patek Philippe means tradition but also innovation. In fact, during its history, the Geneva-based watchmaker applied for over 100 patents, some of them very important for the entire watchmaking industry. The "Patek Philippe Advanced Research" project confirms the vocation of the brand for innovation. Established at the beginning of the 2000s, this avant-garde innovation program enriched traditional development activities with research in the domains of "new materials," "new manufacturing technologies," and "new conceptual fundamentals”, often in cooperation with independent research institutions such as the CSEM research laboratory and the Ecole Polytechnique Fédérale de Lausanne (Swiss Federal Institute of Technology Lausanne). Since 2005, Patek Philippe launched special limited-edition timepieces to showcase various innovations resulting from the research activities. 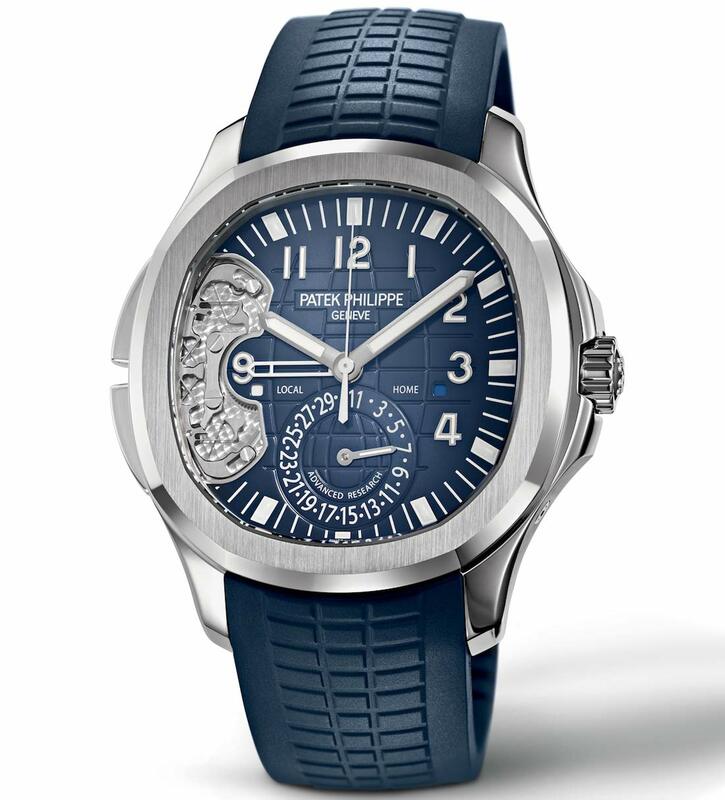 In 2017, Patek Philippe is introducing the Aquanaut Travel Time Ref. 5650G Advanced Research, a 500-piece limited edition endowed with two important innovations in the field of horological design. The first innovation is a new Spiromax balance spring (originally introduced in 2006) with an improved geometry based on the addition of an inner boss, a bulge at the inner end of the spring for which several patents were awarded. It was developed within the scope of the Patek Philippe Advanced Research concept and offers ideal prerequisites for mastering one of the fundamental problems affecting oscillators with balance wheels and hairsprings: isochronism (when every semi-oscillation has the same duration regardless of its amplitude and the orientation of the watch). The outer boss of the Spiromax balance spring is now paired with an inner boss. 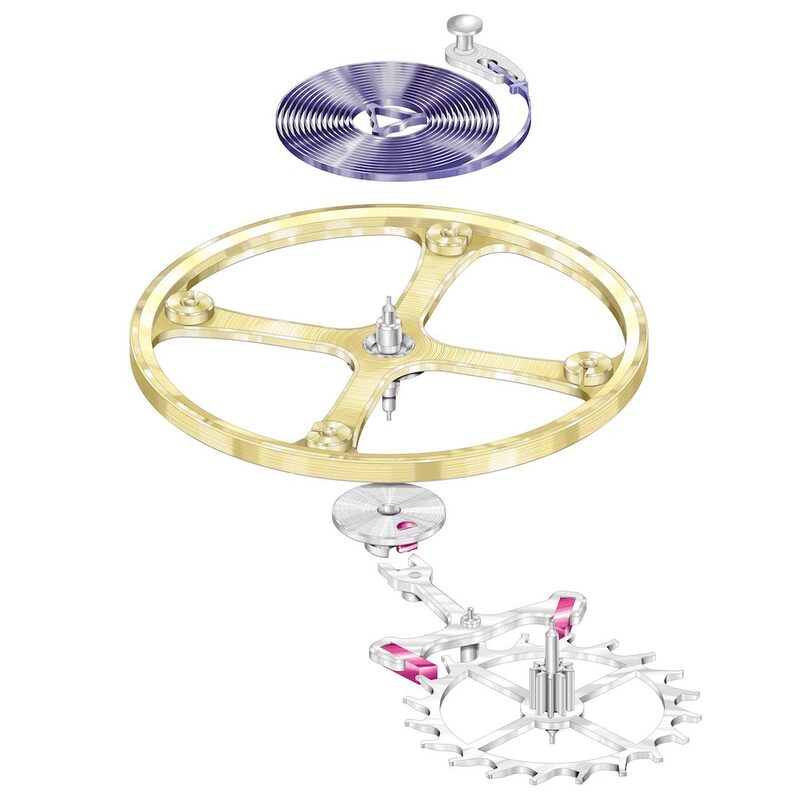 The outer boss, also referred to as the Patek Philippe terminal curve, improves the isochronism of the balance in all positions by assuring the adequately concentric expansion and contraction of the balance spring. It compensates the disruption of isochronism caused by the escapement and the rotation of the balance regardless of the amplitude. Conversely, the inner boss offsets positional changes of the centre of gravity to assure the highest possible rate accuracy in vertical orientations. For the owner, this means that the watch will not run slower or faster regardless of its orientation. 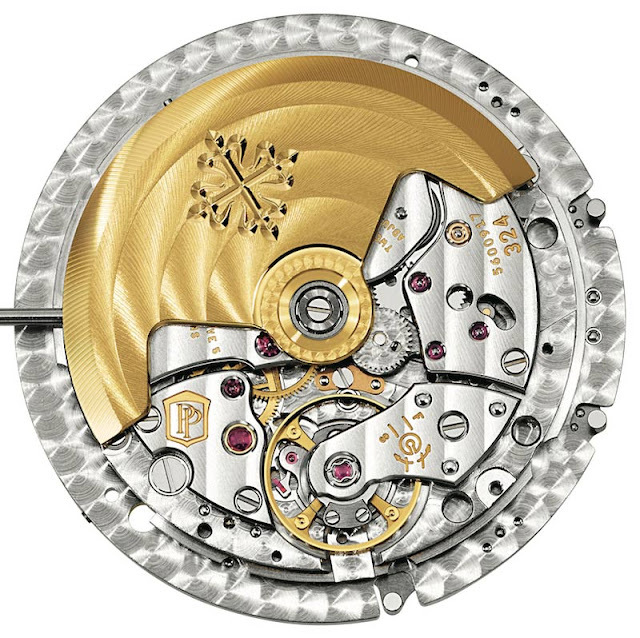 Hundreds of repetitive measurements performed by Patek Philippe's certification laboratories have shown that a mechanical Patek Philippe movement with a Spiromax balance spring that has both an outer and an inner boss can be adjusted to a mean rate of -1 to +2 seconds per 24 hours, which matches the rate accuracy of a Patek Philippe movement with a tourbillon. The scope of the Patek Philippe Advanced Research program goes beyond new materials and technologies but also focuses on the optimization of already existing mechanisms. In fact, the second of the two innovations presented here relates to a steel part manufactured with conventional production methods. The principle of "flexible mechanisms" harnesses the elasticity of materials to replace mechanical articulations composed of pivots and leaf springs. This approach has already proven itself in various applications that require extreme precision, especially telescopes in space research. To assess its suitability and feasibility in horology, the researchers attempted to integrate the concept in the time-zone setting mechanism of the calibre 324 S C FUS movement which is used also for other Patek Philippe timepieces like the Calatrava Pilot Travel Time. It is a kinematically very complex mechanism (interaction of two rotary motions, disconnection of pushers) involving functions that are commonplace in horology for controlling a wide range of forces, among them those of levers and clicks. 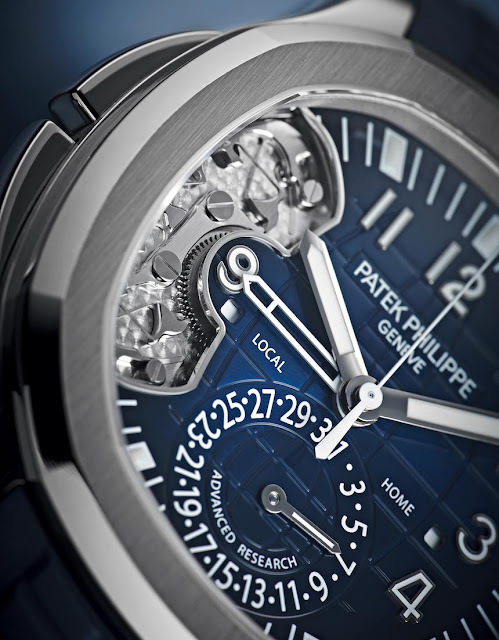 Visible through the partially open dial, the new setting device developed in the Patek Philippe Advanced Research venture consists of four crossed leaf springs – two for each corrector button (one for the setting lever, one for the beak that advances the gear rim), each with defined pressure points. The individual leaf springs are extremely thin and cross over each other at a distance of 150 microns (0.15 mm). They are manufactured with conventional horological steel using methods typically deployed in watchmaking companies with latest- generation computer-programmable machines. 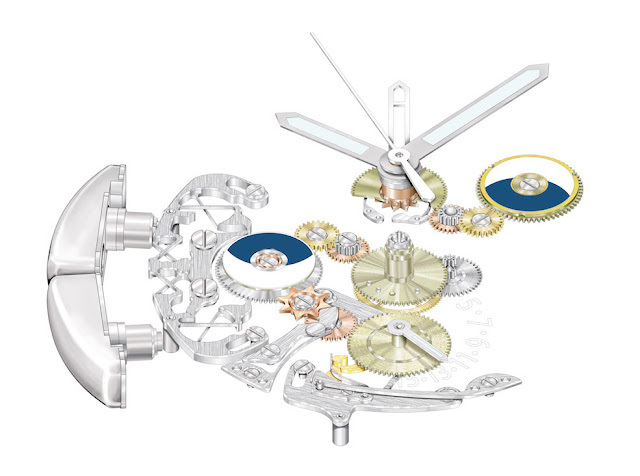 The new control mechanism for time-zone adjustments with flexible elements unites many advantages: simpler assembly (12 parts as opposed to 37), faster assembly (4 screws), flatter silhouette (1.24 mm versus 1.45 mm), no mechanical play, no friction, and no arbor wear, which assures completely lubricant-free functionality. 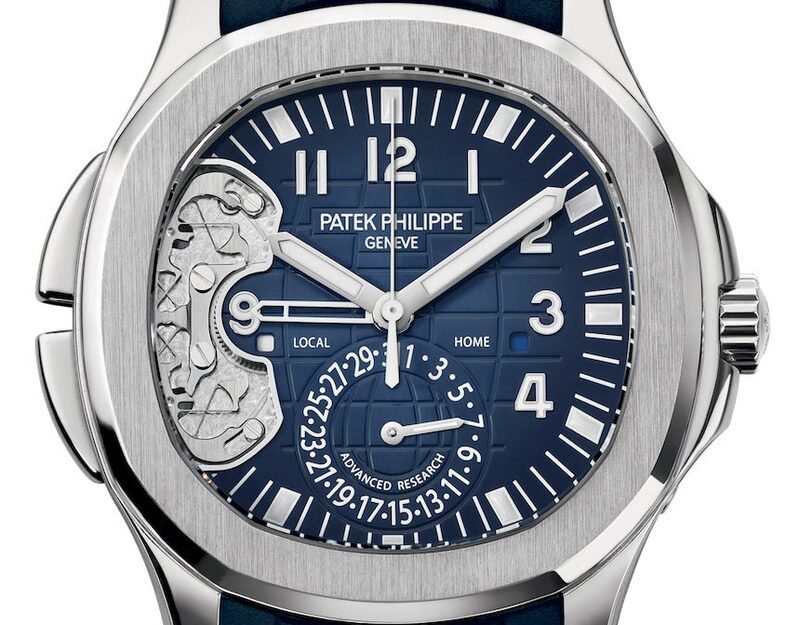 The surfaces of the new mechanical setting element comply with the directives of the Patek Philippe Seal and are carefully finished and decorated according to Genevan watchmaking traditions. All edges are meticulously chamfered and polished (except, for functional reasons, those of the leaf springs). 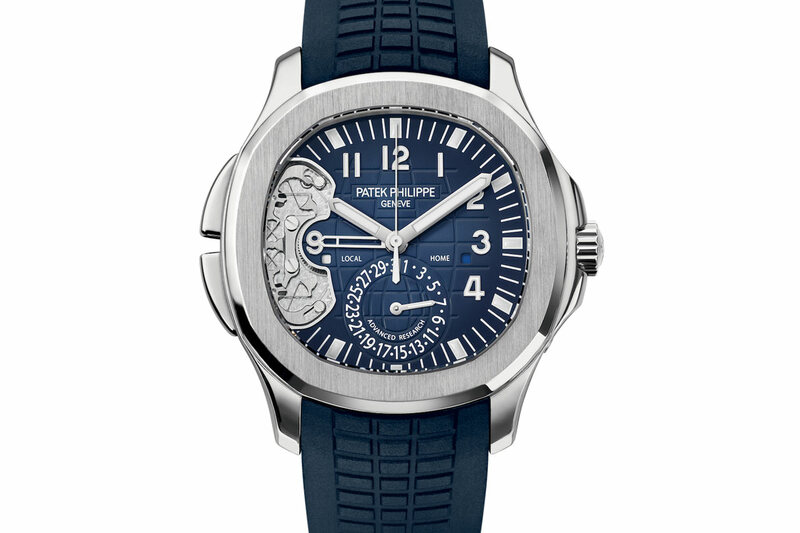 Patek Philippe Aquanaut Travel Time Ref. 5650G Advanced Research. In 2017, Patek Philippe is introducing the Aquanaut Travel Time Ref. 5650G Advanced Research, a 500-piece limited edition endowed with two important innovations in the field of horological design. The Patek Philippe Aquanaut Travel Time Ref. 5650G Advanced Research comes in a 40.8 mm wide and 11 mm thick case crafted from white gold with a price of Euro 54,000 / US$ 59,000.